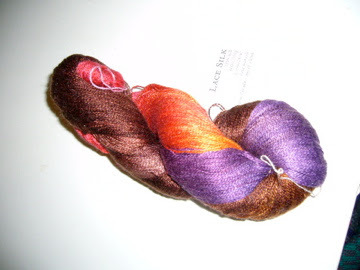 …or, How Kristina Went to the LYS for Buttons Only and Ended Up Buying More Handmaiden and Fleece Artist. I imagine that just about any knitter who reads this will relate to tales of an everburgeoning stash. 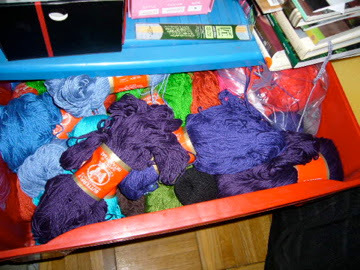 My stash drawers and tote box, in particular, runneth over with fancy silks, silk blends and wool by those beckoning sirens, Handmaiden and Fleece Artist. 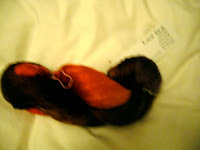 When I got to the LYS, however, I realised that I had forgotten they now close on Mondays! I remained remarkably calm. After all, there was a huge sewing emporium just down the street. So, I popped in there and got the buttons. 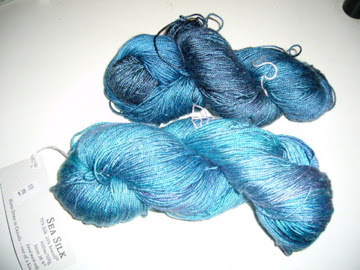 I felt quite virtuous that I hadn’t just gone back to the office and tried the LYS again on Tuesday instead. No one, apparently, except Evil Kristina, to whom the yellowy-green colour was a light beckoning me towards some oasis. By the time I left work it was pouring with rain which was starting to turn into sleet. I made a steadfast decision not to stop in at Knitomatic (a ten minute walk from my place) and instead to take the bus all the way home. Until, that is, the Knitomatic bus stop (as I have come to think of it – I can’t even tell you the name of the cross-street!) approached. Evil Kristina: Hey!!! You forgot to pull the bell cord. Our stop’s coming up. Good Kristina: I told you we’re not stopping here tonight. The weather is crap, and besides, that colour is horrid. Evil Kristina: Well then, let’s just go have a look at it again. It will make you feel good to walk out of there without having bought anything. Good thinking. At any rate, although no one usually gets off at this stop, about five people stood up and made tracks to the door. This was a sign. 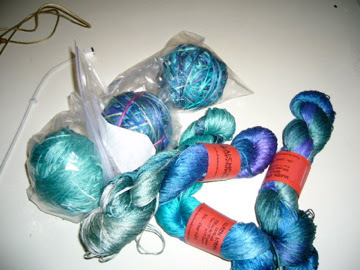 So, when I arrived at Knitomatic looking like a drowned chipmunk (oh, did I mention I forgot my umbrella today? 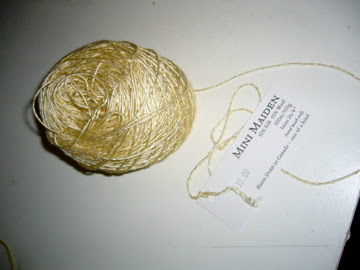 ), I headed straight for the little baskets where the Fleece Artist and Handmaiden yarns live. And guess what I saw? 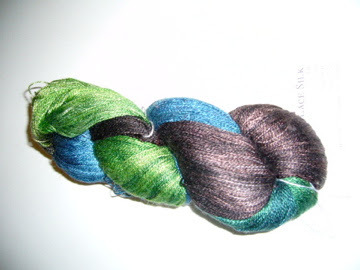 A shiny buttercream confection of half silk, half wool – by Handmaiden. Good Kristina: Put that back. You don’t need it. Evil Kristina: Of course I don’t need it – I want it! It’s only $31 – a steal! 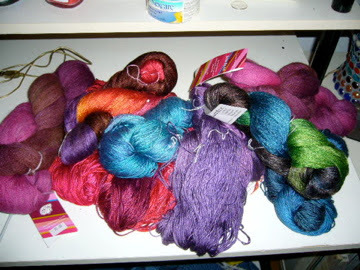 Good Kristina: But just think of that whole stash of Handmaiden and Fleece Artist that we came across yesterday in the spare room! Evil Kristina: Did you see any in this colour there? Good Kristina: Er… no, come to think of it. 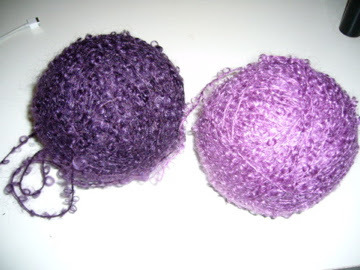 Evil Kristina: Well, don’t we need a nice neutral colour for a change to balance off all those jewel tones? Good Kristina: NO!!! 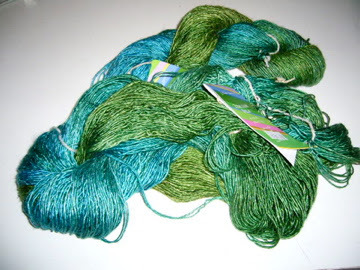 Besides, since you bought all that laceweight yarn, you haven’t even wanted to knit any more lace! So, what is the point of buying more? 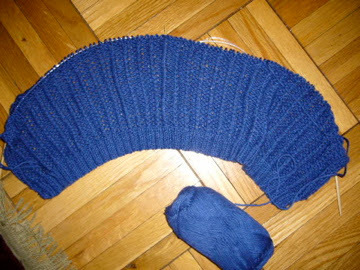 Evil Kristina: I already told you, that’s going to be the New Year’s resolution – lace knitting. Forget that “quitting smoking” bit. You just set yourself up for failure when you try to quit smoking at New Year’s! Good Kristina: But we don’t even believe in New Year’s resolutions!!! Evil Kristina: My point exactly!! Good Kristina: That doesn’t even make sense, you moron. Besides, we decided at the beginning of the summer that we wouldn’t be buying any more wool, and stick to cotton and other stuff. Evil Kristina: Oh? So why’d you buy this in August then? Good Kristina: (grasping at straws) Well, it was cheap. 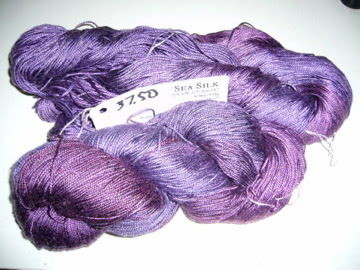 And I still want to knit lace. Evil Kristina: But the buttercream colour looks so Victorian! It’s perfect for lace. Evil Kristina: So, what about this one then? Good Kristina: (exasperated) What about it?!? The buttercream one is meant to be instead of this one. Let’s just pay for it and go. Evil Kristina: But it’s so funky!! Good Kristina: It is not “funky”, it’s hideous. Why do you think it’s still sitting there? Because no one wants to buy it! 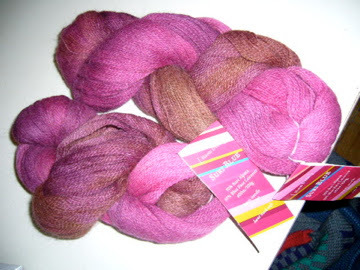 Evil Kristina: But it’s Italian Silk by Handmaiden!! 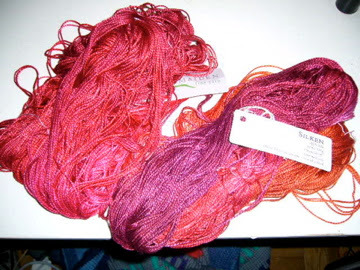 Good Kristina: We already have two skeins of that, don’t you remember?!? …and just had to have it!! Good Kristina: (sulking) It was my birthday that week. Evil Kristina: Ah yes, your birthday. Didn’t you buy the Alchemy that week as well, because you just had to make that Oriel blouse which now you don’t even like any more? Evil Kristina: And how convenient that it falls right after that stupid Payday holiday you’ve started celebrating to justify your spending to yourself! 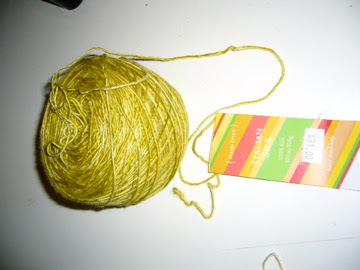 Good Kristina: We’re not getting the chartreuse colour. Period. Evil Kristina: Look, you know you’re just going to come back later in the week for it – and you’ll be pissed off if it’s not there! Evil Kristina: Look at it this way. You’re knitting that vest for JJ, right? 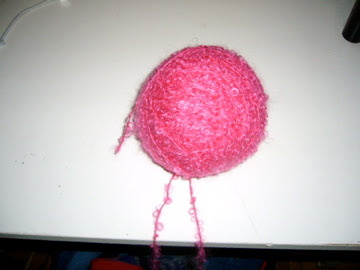 Despite the fact that you have all this other stuff you want to make for yourself? So, don’t you deserve a little treat? Evil Kristina: Hey, you’ve got lots of willpower. You’ll finish it. He needs it for the trip, right? Good Kristina: …well, all right then. Final score: 2/0 for Evil Kristina. Good Kristina: Well, surely that doesn’t really count as I bought it on sale 1/2 price! Evil Kristina: Yeah, but were these two on sale? Huh? Huh? You would think that I would learn, wouldn’t you! Sigh. In closing, last year on this day Harper (the PM)’s motion to declare Québécois “a nation within a unified Canada” was endorsed. I still haven’t figured out what that means, but hey.